Pollinators are responsible for 1 out of 3 bites of food we humans eat — yet their habitat is shrinking and many species are in danger. Whole Foods Market® is passionate about restoring wildflower habitat, protecting pollinators and mobilizing our communities to make a difference. 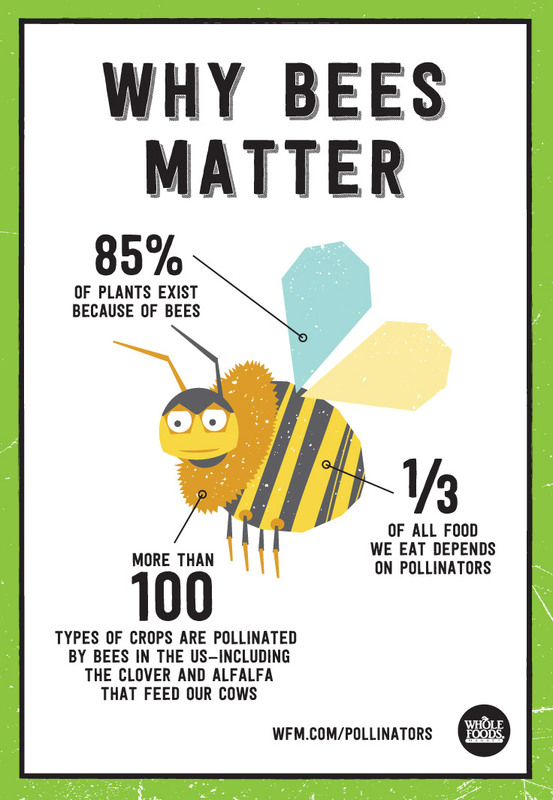 From apples and almonds to strawberries and tomatoes, many of our most beloved foods depend on pollinators. If pollinators disappeared from the planet, even beef and dairy products would be scarce, because pollinators are vital to crops that feed cattle and other grazing animals. Watch the videos to see how some of your favorite foods would look without pollinators. Honey bees pollinate more than 100 types of crops in the US — but they can’t do it alone. 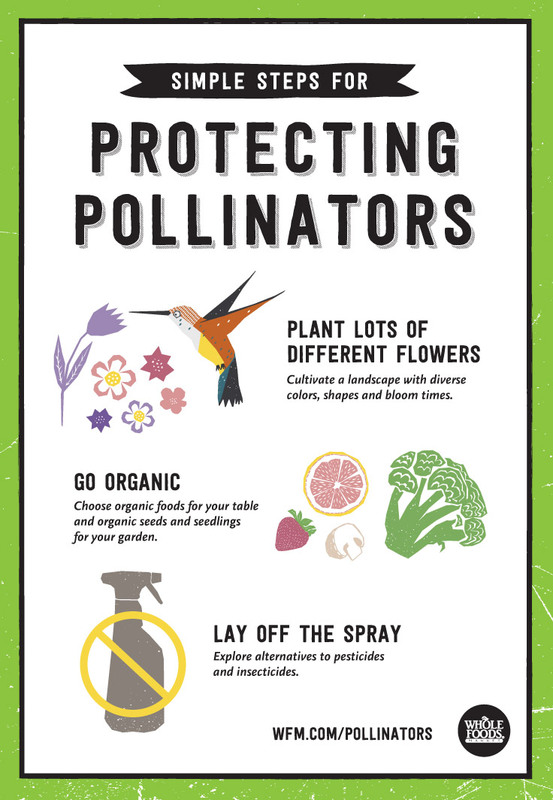 Other types of pollinators work alongside bees, helping to maintain the diversity of plant life and playing crucial roles in our ecosystem. Meet some of the honey bee's fascinating friends — bumblebee, monarch butterfly, hawk moth, firefly and hummingbird — and find out how you can help. Our nonprofit partner, The Xerces Society, protects wildlife through the conservation of invertebrates and their habitat. The Society advocates on behalf of pollinators by publishing research, educating policy makers and land managers to restore the landscape for the benefit of pollinators. Since 2012, with your help Whole Foods Market and our vendors have donated more than $547,000 to the Xerces Society. These funds have helped create or improve over 186,000 acres of pollinator habitat in the United States, with tens of thousands more acres in development. Almonds are dependent on honey bees and other pollinators to bear fruit. However, almond trees only flower in the winter. Farming monoculture, in which land is devoted solely to one crop (e.g., almonds), makes it hard for pollinators to find year-round food and means that almonds and other crops are increasingly dependent on commercial bees that are trucked from one crop to another. Whole Foods Market is proud to introduce our 365 Everyday Value® Pollinator Friendly Almonds and Almond Butter. They’re sourced from an orchard that works with conservationists at The Xerces Society to create a welcoming environment for pollinators. The orchard planted diverse wildflowers around the almond trees to provide year-round sustenance for local bees. Because the future of food depends on healthy pollinators, Whole Foods Market® collaborates with supplier partners who support them. Cascadian Farm protects pollinators by farming organically and donating to wildflower restoration and bee research. Blue Diamond Growers protect pollinators by donating to research on bee health and planting diverse ground cover around their almond orchards.